Captain Pradip Kumar Gour , son of Shri Mata Prashad Gour, was born on 15th April 1945 in Shimla, Himachal Pradesh. Capt Gour completed his initial education from Harcourt Butler higher secondary school in New Delhi. He then joined the Army as an emergency commissioned officer in 1964 and joined 85 Light Regiment of Artillery. Later Capt Gour got trained as a helicopter pilot and served in 660 Air Op Squadron. 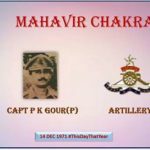 In 1971 during the time of Indo- Pak war, Captain Gour was posted to 36 Artillery Brigade operating in Shakargarh sector. As an Air Op Pilot he was tasked to locate and direct the artillery fire on enemy positions. As per the direction he led many missions inside the enemy territory facing small arms and artillery fire. 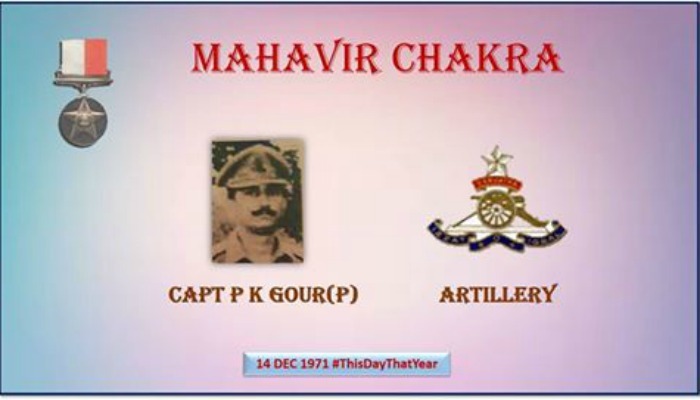 On 11th December 1971, eleven enemy tanks had aimed and encircled the Indian posts at Malidpur. This movement of enemy troops was noticed by Captain Pradip Kumar Gour and he immediately cautioned the troops about the direction, strength and likely aim of the enemy tank force. He manoeuvred his small unarmed plane in such a manner that all the enemy’s attempts to shoot him down failed. In the meantime, he directed artillery fire completely on the enemy tanks and as a result eight enemy tanks were knocked out and two were badly damaged. The operation of crossing the Bein River which guards the eastern approach to Shakargarh, was launched on 14th December. On that day morning Captain Gour was airborne for three hours to locate the targets inside the enemy territory. Unfortunately, he was spotted at 1655 hrs, and enemy engaged Sabre jets on his trail ; later three enemy jets closed in on him. Despite the warning signals he continued his task while undertaking manoeuvres to evade the enemy. However, he was surrounded by the enemy jets and was finally shot down. Capt Pradip Kumar Gour displayed exceptional courage, professional competence and devotion to duty in keeping with the finest tradition of Indian Army. He was given the nation’s second highest gallantry award “Maha Vir Chakra” for his gallantry and supreme sacrifice. Captain Pradip Kumar Gour was a pilot with an air observation post squadron deployed on the Western Front. Throughout the operations, he flew round the-clock missions deep inside enemy territory, directing artillery fire and obtaining vital information about the enemy, undeterred by heavy small arms and artillery air burst fire. On 14 December 1971, while locating and registering targets deep inside enemy territory, Captain Gour saw three enemy Sabre jets operating in the area. Instead of returning to the base and avoiding the danger, he decided to continue with the mission in view of its vital nature. He carried on with his mission evading the Sabre jets. Eventually he was shot down. In this action, Captain Gour displayed extraordinary devotion to duty and made the supreme sacrifice. 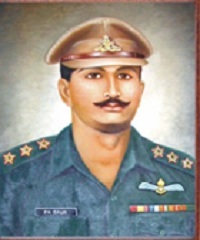 A housing project in Chandigarh has been named after Capt Pradip Kumar Gour MVC as “Pradip Vihar”. PK WAS VERY WELL KNOWN TO ME …FIRSTLY WE ARE FROM REGIMENT OF ARTILLERY AND SECONDLY, BOTH ARE ALSO AIR OP PILOTS…HE WAS POSTED IN 660 AIR OP SQUADRON DURING 1971 OPERATIONS AND I WAS POSTED IN 2 AIR OP FLIGHT, OPERATING AT THE SAME TIME IN CHHAMB SECTOR. WHEN HE LAID DOWN HIS LIFE FLYING IN THE SHAKARGARH AREA BY THE PAKISTANI SABRE JETS, I TOO WAS ENGAGING TARGETS IN THE CHHAMB SECTOR. PK GAUR’S AIRCRAFT BEING SHOT DOWN WAS INTIMATED ON WIRELESS SET TO OTHER AIR OP PILOTS FLYING IN THE SECTOR AND CAUTIONED OF THE PAK JETS MAKING OTHER ATTEMPTS TO SHOOT DOWN AIR OP AIRCRAFT. I RECALL THAT PK’S SACRIFICE SAVED THE LIFE OF OTHER PILOTS…PK IS ALWAYS REMEMBERED BY ALL AIR OP PILOTS OF THE GENERATION WITH GREAT FONDNESS. SALUTE TO CAPT PK GAUR, MVC…! I was his neighbor in Babar Place in New Delhi from 1957 to 1960. I think about him very often.